Dislocation of the elbow occurs when the upper arm bone or humerus, moves out of place from the two bones of the forearm, the ulna and radius. The three bones meet at the elbow joint, which is displaced in a elbow dislocation. The injury typically produces considerable pain, swellings and loss of movement in the injured arm. Contact sports are more prone to such injuries. Fractures as well as injuries to arteries and nerves sometimes accompany dislocation. A partial is known as subluxation. The elbow provides the arm with flexion and extension capacity as well as pronation and supination ability, affording great range of motion. Considerable force is required to dislocate the elbow hinge joint. The humerus and ulna are generally stable and are reinforced by ligaments, primarily the ulnar (medial) collateral ligament, which is composed of three strong bands (anterior oblique, posterior oblique, and transverse) that reinforce the medial side of the capsule. The radial (lateral) collateral ligament is a strong triangular ligament that reinforces the lateral side of the capsule. These ligaments connect the humerus to the ulna and act together to stabilise the elbow. Blow or other trauma to the elbow. Fall onto an outstretched arm. Violent contact between the elbow and other athlete or object. Severe pain in the elbow, swelling, and loss of arm flexibility. Loss of feeling in the hand, following sharp injury to the elbow. Nerve or arterial injury following trauma to the elbow. Improper healing can follow a dislocation if left untreated. The results can involve nerve and arterial damage, osteoarthritis, ongoing pain in the injured arm, loss of full movement, and distortion of the elbow joint. Infection of the dislocated region is also possible, particularly if a fracture in involved. Ice should be used to reduce initial pain and swelling, as proper medical attention is sought. The elbow should be moved as little as possible, and elevated frequently. Proper attention to athletic technique and padding of the elbow region, especially in the case of contact events like football, may help prevent such injuries. Generally, dislocations without further complication of nerve or artery damage, heal thoroughly given proper initial care and some rehabilitative exercises. 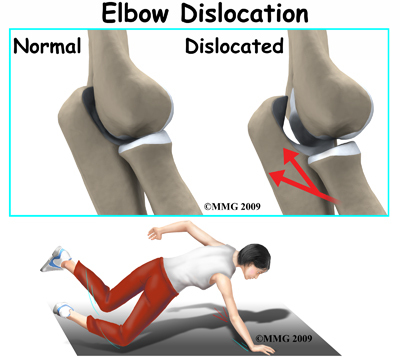 Call (+65) 6471 2674 (24 Hour) to see our doctor regarding Elbow Dislocation today.